Polycythemia vera (PV) is a disorder of the multipotent hematopoietic stem cell that manifests as excess production of normal erythrocytes and variable overproduction of leukocytes and platelets. It is grouped with the Philadelphia chromosome–negative myeloproliferative disorders and can usually be differentiated from them by the predominance of erythrocyte production. See the image below. Clonality and erythropoietin (Epo) independence are the two key aspects of polycythemia biology. A single clonal population of erythrocytes, granulocytes, platelets, and variable clonal B cells arises when a hematopoietic stem cell gains a proliferative advantage over other stem cells. The T lymphocytes and natural killer cells remain polyclonal in polycythemia vera; this is related to their longevity. Clonality can currently only be tested in females using X-chromosome polymorphisms that take advantage of X-chromosome inactivation. Epo independence is the ability of polycythemia vera hematopoietic stem cells to grow erythroid colonies without Epo. Although the colonies do not require erythropoietin, they remain responsive to it, and the erythropoietin receptor (EpoR) is normal, without defects in its function or quantity. Experiments using antibodies to neutralize Epo or block the EpoR do not abolish Epo-independent erythroid colony formation. The JAK2V617F mutation leads to constitutive phosphorylation, thus constitutive activity and STAT recruitment, which provides the proliferative advantage seen in polycythemia vera. This process occurs in the absence of Epo and explains both the Epo independence and Epo hypersensitivity of polycythemia vera colonies. A mouse model of this mutation produced a clinical phenotype consistent with polycythemia vera. These data were rapidly confirmed by several groups; each reported that more than 90% of patients with polycythemia vera carry the JAK2V617F mutation. However, compelling data strongly argue that this mutation is not a disease-initiating mutation. Rather, an as-of-yet unidentified mutation or mutations predispose to the acquisition of polycythemia vera. Patients with the JAK2V617F mutation tend to have the clinical phenotype of essential thrombocythemia.The quantitative allele burden (ratio of mutant to wild type expression) of JAK2V617F also has a clinical impact. Data from Vannucchi et al reveal that higher quantitative levels of the JAK2V617F allele correlated with higher values for hematocrit. WBC and lactate dehydrogenase levels were positively correlated with the level of the mutation. The highest JAK2V617F levels at diagnoses predicted patients more likely to have splenomegaly, develop presenting pruritus, or eventually require chemotherapy. Also, the rate of presenting major thromboses was positively correlated with higher mutation values. In fact, a multivariate analysis that included age, leukocytosis, hematocrit, platelet count, and therapies indicated that JAK2V617F/JAK2 wild type ratio is an independent risk factor for major vascular events. This was also validated by Silver et al, suggesting greater JAK2V617F allele burden correlates with higher white cell count, splenomegaly, and thromboembolic disease. [7, 8] They also suggested a higher frequency of myelofibrosis. The incidence of polycythemia vera is reported to be 4.9 cases per 100,000 population in Baltimore. A more recent review of polycythemia vera in Connecticut reported an incidence of 22 cases per 100,000 population. The disease appears more common in Jews of European extraction than in most non-Jewish populations. Some familial forms of polycythemia vera are noted, but the mode of inheritance is not clear. Men are preferentially affected over women. The male-to-female ratio is 1.2-2.2:1. The course of polycythemia vera may or may not follow two phases. The plethoric phase usually occurs first and is characterized by hyperproliferation of cellular components. The principle manifestations during this phase are thrombosis and hemorrhage. Consequently, treatment is aimed at ameliorating symptoms. The plethoric phase can last for a few years to as many as 20. Following the plethoric phase, the spent phase is characterized by progressive anemia, fibrosis, and splenomegaly. The smear demonstrates anemia, thrombocytosis (or thrombocytopenia), and leukocytosis (or leukopenia/neutropenia). In contrast to the plethoric phase, patients in the spent phase are often transfusion dependent. Except for potential leukemic transformation, appropriately treated polycythemia vera is compatible with near normal life. Without treatment, 50% of patients die within 18 months of diagnosis, usually from a thrombotic event. Survival with treatment depends on modality. Median survival is 13.9 years for phlebotomy alone, 11.8 years for P32, and 8.9 years for chlorambucil. A European study, by Marchioli and colleagues, attempted to further define the prognosis of this disease;  1,638 patients were prospectively followed in an attempt to describe the clinical history of polycythemia vera. The primary limitation of this study is a mean follow-up of 2.7 years. The overall mortality rate was 3.7 death per 100 persons per year. This was primarily caused by a moderate rate of cardiovascular death (1.7 deaths per 100 persons per year) and a high rate of death from noncardiovascular causes (1.8 deaths per 100 persons per year), primarily hematologic transformations. Cardiovascular mortality accounted for 45% of all deaths. Hematologic transformation (13% of all deaths) and solid tumors (19.5%) were also significant causes of mortality. As previously seen in other studies, age older than 65 years and history of previous thrombosis were also significantly associated with mortality risk. Cumulative rate of cardiovascular events was 5.5 per 100 persons per year. Rates of combined malignancy, hematologic transformation, and non–polycythemia vera related malignancies were 3, 1.3, and 1.7 per 100 persons per year, respectively. Zivot A, Lipton JM, Narla A, Blanc L. Erythropoiesis: insights into pathophysiology and treatments in 2017. Mol Med. 2018 Mar 23. 24 (1):11. [Medline]. [Full Text]. Kralovics R, Guan Y, Prchal JT. Acquired uniparental disomy of chromosome 9p is a frequent stem cell defect in polycythemia vera. Exp Hematol. 2002 Mar. 30(3):229-36. [Medline]. Kralovics R, Passamonti F, Buser AS, et al. A gain-of-function mutation of JAK2 in myeloproliferative disorders. N Engl J Med. 2005 Apr 28. 352(17):1779-90. [Medline]. Nussenzveig RH, Swierczek SI, Jelinek J, et al. Polycythemia vera is not initiated by JAK2V617F mutation. Exp Hematol. 2007 Jan. 35(1):32-8. [Medline]. Vannucchi AM, Antoniolim E, Guglielmelli P, et al. Plenary session. ASH Annual Meeting Abstracts. Blood. 2006. 108. Silver RT. Interferon alfa: effects of long-term treatment for polycythemia vera. Semin Hematol. 1997 Jan. 34(1):40-50. [Medline]. Silver RT. Recombinant interferon-alpha for treatment of polycythaemia vera. Lancet. 1988 Aug 13. 2(8607):403. [Medline]. Carobbio A, Finazzi G, Antonioli E, et al. JAK2V617F allele burden and thrombosis: a direct comparison in essential thrombocythemia and polycythemia vera. Exp Hematol. 2009 Sep. 37(9):1016-21. [Medline]. [Full Text]. Szuber N, Vallapureddy RR, Penna D, et al. Myeloproliferative neoplasms in the young: Mayo Clinic experience with 361 patients age 40 years or younger. Am J Hematol. 2018 Aug 29. [Medline]. Roaldsnes C, Holst R, Frederiksen H, Ghanima W. Myeloproliferative neoplasms: trends in incidence, prevalence, and survival in Norway. Eur J Haematol. 2016 Aug 8. [Medline]. Berk PD, Wasserman LR, Fruchtman SM. Treatment of polycythemia vera: a summary of clinical trials conducted by the polycythemia vera study group. Wasserman LR, Berk PD, Berlin NI, eds. Polycythemia vera and the myeloproliferate disorders. Philadelphia: WB Saunders; 1995. 166. Marchioli R, Finazzi G, Landolfi R, Kutti J, Gisslinger H, Patrono C. Vascular and neoplastic risk in a large cohort of patients with polycythemia vera. J Clin Oncol. 2005 Apr 1. 23(10):2224-32. [Medline]. Patel RK, Lea NC, Heneghan MA, Westwood NB, Milojkovic D, Thanigaikumar M. Prevalence of the activating JAK2 tyrosine kinase mutation V617F in the Budd-Chiari syndrome. Gastroenterology. 2006 Jun. 130(7):2031-8. [Medline]. Thurmes PJ, Steensma DP. Elevated serum erythropoietin levels in patients with Budd-Chiari syndrome secondary to polycythemia vera: clinical implications for the role of JAK2 mutation analysis. Eur J Haematol. 2006 Jul. 77(1):57-60. [Medline]. Giona F, Teofili L, Moleti ML, Martini M, Palumbo G, Amendola A, et al. Thrombocythemia and polycythemia in patients younger than 20 years at diagnosis: clinical and biologic features, treatment, and long-term outcome. Blood. 2012 Mar 8. 119(10):2219-27. [Medline]. Crielaard BJ, Rivella S. ß-Thalassemia and Polycythemia vera: targeting chronic stress erythropoiesis. Int J Biochem Cell Biol. 2014 Jun. 51:89-92. [Medline]. [Full Text]. Cario H, McMullin MF, Bento C, Pospisilova D, Percy MJ, Hussein K, et al. Erythrocytosis in children and adolescents-classification, characterization, and consensus recommendations for the diagnostic approach. Pediatr Blood Cancer. 2013 Nov. 60(11):1734-8. [Medline]. Barbui T, Thiele J, Gisslinger H, Finazzi G, Vannucchi AM, Tefferi A. The 2016 revision of WHO classification of myeloproliferative neoplasms: Clinical and molecular advances. Blood Rev. 2016 Jun 11. [Medline]. [Guideline] Spivak JL, Silver RT. The revised World Health Organization diagnostic criteria for polycythemia vera, essential thrombocytosis, and primary myelofibrosis: an alternative proposal. Blood. 2008 Jul 15. 112(2):231-9. [Medline]. Kondo T, Okuno N, Naruse H, et al. Validation of the revised 2008 WHO diagnostic criteria in 75 suspected cases of myeloproliferative neoplasm. 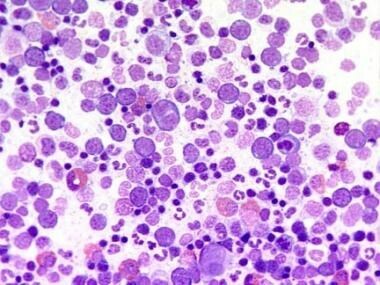 Leuk Lymphoma. 2008 Sep. 49(9):1784-91. [Medline]. Di Nisio M, Barbui T, Di Gennaro L, et al. The haematocrit and platelet target in polycythemia vera. Br J Haematol. 2007 Jan. 136(2):249-59. [Medline]. Landolfi R, Marchioli R, Kutti J, Gisslinger H, Tognoni G, Patrono C. Efficacy and safety of low-dose aspirin in polycythemia vera. N Engl J Med. 2004 Jan 8. 350(2):114-24. [Medline]. Kiladjian JJ, Cassinat B, Turlure P, et al. High molecular response rate of polycythemia vera patients treated with pegylated interferon alpha-2a. Blood. 2006 Sep 15. 108(6):2037-40. [Medline].